All businesses, no matter what size, should ‘think brand’. 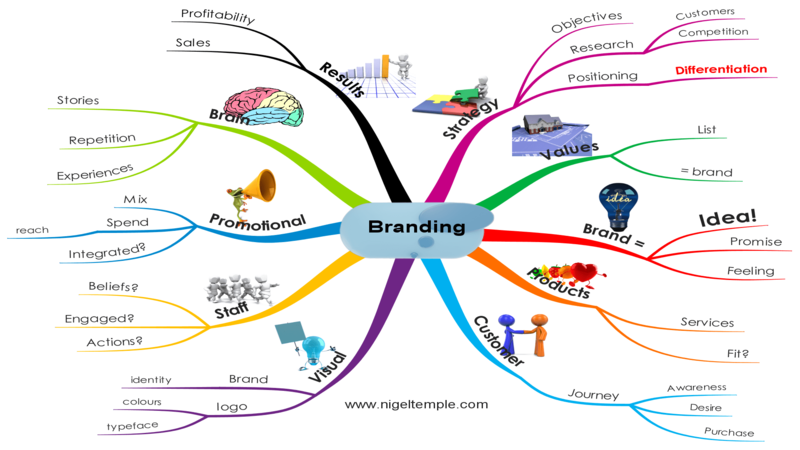 Here is a Mind Map (click to expand) which shows the key elements of branding. Scroll down to see a checklist, which explains what the branches mean. If you are creating a brand, it will be built on your values. Write a list of your values and include them within your marketing plan. Brand positioning – click here to read all about it. What’s the big idea, then? Successful brands are underpinned by a central idea. What is the big idea which drives your brand? (If there is any difficulty in responding to this question – call me). Do your products / services fit with your brand? Are they aligned with your brand values? Do they support the brand or detract from it? From initial encounter and awareness, to desire, purchase and advocacy – is there brand consistency? I am not just referring to your visual brand identity, I am talking about brand identity and character. Are you using your logo, colours and typeface consistently? For example, I have used Arial for as long as I can remember. I use it within my website, blogs, emails and all of my printed matter. Staff, colleagues, teams – do they get your brand? Does everyone within your enterprise understand what your brand is all about? Gather them together and ask them to write down what your brand stands for. Compare the results. (Be prepared for a surprise). Incidentally, engaged staff create the best brands. (If you would like me to come over and do this exercise, you are welcome to contact me). Is your promotional mix integrated? Does it all have a consistent look and feel or is it all over the place? People love stories. What stories are there to tell about your brand? How are you getting these stories out there? People learn through experience – what kind of experience does your brand deliver? Above all, how does it make your customers feel? An established brand is worth more money than a non-branded enterprise. Brands attract more customers and they deliver a higher level of profitability than their commodity cousins. If you would like to talk to me about your marketing strategy and brand – by all means get in touch. This could be one of the most important and influential conversations you ever have about your business. Nigel is a marketing consultant, author, speaker and trainer. He shows businesses how to get better results from 21st century marketing – starting with marketing strategy and brand positioning. He advises business owners, boards of directors and teams. Nigel has taught marketing strategy since 1996. He has an honours degree in marketing and served as a Faculty Member and Course Director at CIM (the Chartered Institute of Marketing) for 12 years. He led over 500 Business Link workshops, focusing on marketing strategy and internet marketing. Today, he delivers marketing events for The Marketing Compass which provides impartial marketing advice for business owners. Nigel is the founder of The Marketing Compass – join thousands of business owners, tell us about your business and ask some marketing questions!